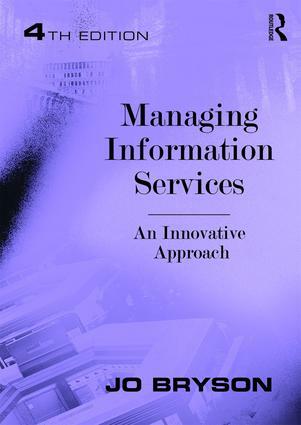 This fourth edition of Jo Bryson's highly regarded Managing Information Services has been thoroughly revised with an emphasis on innovation. Operating in a digital era, libraries must innovate to survive and grow. This means librarians having radical ideas which challenge the status quo, shifting strategic directions to change the way services are managed, and developing new skills and knowledge. Challenges include developing new uses for floorspace, where shelving is being replaced by mobile networking, and new practices and procedures for managing new products such as e-books and self-service. Libraries can achieve long term sustainability by information managers having more creative responses and developing innovative thinking. Essential reading for information students, this text also serves as a comprehensive and detailed reference on the key management topics for information service managers. Jo Bryson is a senior management consultant and international speaker in strategy, planning and corporate governance. Her current consulting role involves assisting Chief Executive Officers and Boards lead, transform and change the strategic direction of their organizations. Previously Jo held executive management positions in the library, information and IT sectors at state and international government levels.